Can the U.S. economic sanctions break Iran? LONDON - “The Iran sanctions have officially been cast,” tweeted U.S. President Donald Trump three months after he signed an executive order in May announcing his administration’s withdrawal from the 2015 Iran nuclear deal. He went on to boast the return of “the most biting sanctions ever imposed,” as if sounding the death knell of the Joint Comprehensive Plan of Action (JCPOA), as the deal is officially known. Indeed, Iran and the U.S. seem to have reversed roles: Iran’s isolation before the deal now contrasts with America’s determination to swim against the global tide. Disappointment, if not disbelief, prevailed among the JCPOA’s other parties — the European Union countries, Russia and China — whose leaders were quick to reaffirm their strong commitment to the agreement. Given the long and fraught history of economic sanctions against Iran, the question looming now is whether this time they are more likely to be effective in changing the regime or its behavior. The last time Iran’s oil exports were reduced to negligible levels through an extensive economic boycott was in the mid-20th century, when Iran’s popularly elected prime minister, Mohammad Mossadegh, nationalized the oil industry. A British-led blockade of Iran’s oil brought the industry to a virtual standstill, destabilized the economy and paved the way for the infamous U.S. and U.K.-instigated coup which restored the Shah of Iran to power in 1953. Such remorse, if it can be considered that, did not, however, close the door on more sanctions against Iran. Sanctions imposed by the U.S. and the EU from 2010 to 2015 had mixed results. The resulting stagflation heaped misery on ordinary Iranians, with GDP contracting almost 6 percent in 2012 and inflation averaging 35 percent the following year. Widespread private sector failures and growing unemployment followed. Contrary to the sanctions’ principal objectives, however, the economic and political hold of the public sector and parastatal organizations strengthened. Meanwhile, Iran insisted on its sovereign right to pursue a peaceful nuclear program. The scope for compromise seemed absent until the reformist administration of President Hassan Rouhani took over in 2013. Though promising to be even more biting, the U.S. sanctions regime is not backed by U.N. Security Council resolutions and hence lacks international legitimacy. This means Iran’s isolation will be far less complete, with key trading partners such as China and Turkey already announcing that they will abide by “legal” sanctions only. But the sanctions’ de facto, not de jure, status will determine their effectiveness. This is especially true of European firms, which will ultimately decide the outcome of the battle for secondary sanctions in cognizance of their shareholders’ interests, rather than the political machinations of their governments. This explains the significant stream of exits from Iran’s markets already announced by large firms. In an interconnected world where U.S. economic influence extends far and wide, it is hard even for European firms — auto manufacturers, airlines, energy companies, banks and the like — to risk the ire of the U.S. Treasury. This means that the ultimate success of sanctions is likely to depend on what others make of them as much as on what Iran does. 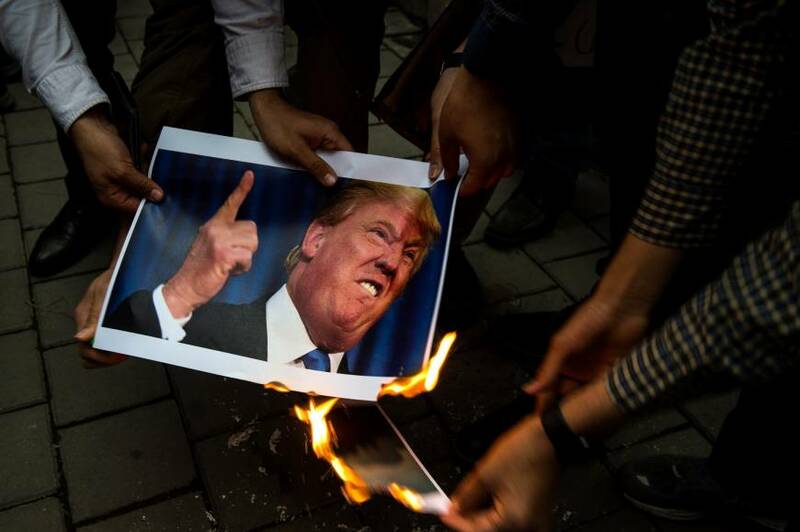 But domestic conditions in Iran also play a key role, and it is here that the U.S. seems to be basing its confidence that sanctions will “succeed.” For months, Iranian cities have been rocked by widespread protests, ostensibly against worsening economic conditions. These outbursts have weakened Iran’s reformers by undermining their monopoly on hope. Hard-liners, it seems, have been offered a new lease on life and can now claim their dismissal of the JCPOA was justified from the start. 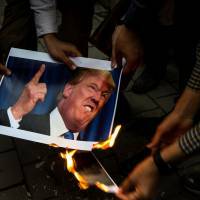 The economic impact has already been felt, with the Iranian currency going into free-fall after speculation about a U.S. withdrawal from the deal began. The specter of inflation is back. Ultimately, for sanctions to succeed from the U.S. perspective, they must bring about either regime change or behavioral change. Historically, sanctions have a less-than-convincing track record (think Cuba, Myanmar and Zimbabwe) on achieving the former, and whether they can pave the way for the latter, in the form of a negotiated settlement, remains to be seen. But one thing is clear: applied to Iran, the “Trump doctrine” of pushing one’s foes to the brink, in the hope that they will blink first, has entered uncharted terrain.